The EPA’s guidance documentation “3T’s for Reducing Lead in Drinking Water in Schools and Child Care Facilities: Training, Testing, Telling” recommends for schools to routinely test their facility’s drinking water, with a focus on lead levels in drinking water fountains. In launching the 3Ts campaign, EPA’s objective is to provide school officials and child care facility operators with the tools they need to understand and address lead in drinking water in their local communities. Based on these recommendations, the Louisville Water Company located in Louisville, KY, initiated a School Lead Monitoring Program which provided services for sampling supplies, training, certified analysis and reporting for at least 15 percent of school facilities annually. As each facility was allocated resources for the testing of only two fountains, selections were based on frequency of use, location and make/model. Samples were analyzed for levels of lead using laboratory Atomic Absorption Spectroscopy (AAS), with a cost per sample of approximately $25. The EPA strongly recommends that all water outlets in all schools that provide water for drinking or cooking meet a standard of 20 ppb lead or less. Louisville Water’s program takes remedial actions for any samples showing results above a 10 μg/L warning level. Collectively, the sample preparation, initial analysis, reporting and follow up analysis would take 3 to 5 weeks to complete, thereby producing long delays to any remedial action. Organization of an effective system to enable consistent laboratory based testing required significant amounts of time to coordinate. In addition, as most schools have between six to 40 drinking water fountains and only two fountains had to be selected, there was the challenge of trying to prioritize which fountains should be sampled. Further facility and fountain evaluation was often recommended, creating additional pressure on already limited resources. It became apparent that the existing lead monitoring program needed to increase the number of fountains sampled, frequency of sampling and considerably reduce the time taken to produce analytical test data, thereby allowing effective and timely remediation actions to be taken. 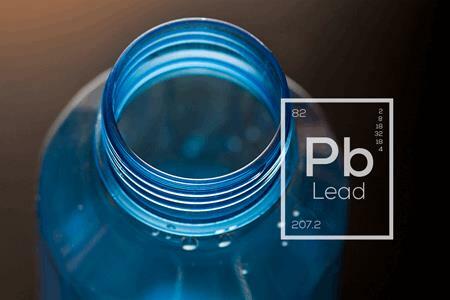 The need to implement effective procedures was further emphasized with the introduction of the “Reduction of Lead in Drinking Water Act” by U.S. Congress in 2011, which became effective January 4, 2014, creating further pressure for improvements in drinking water quality. 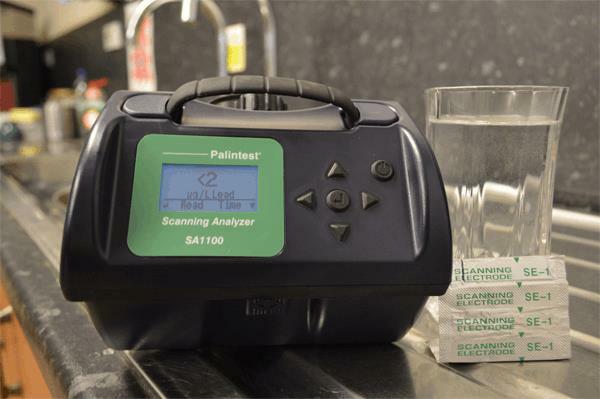 During 2013, Louisville Water purchased two Palintest SA1100 Scanning Analyzers for use in the School Lead Monitoring Program. The SA1100 Scanning Analyzer is an accurate portable scanning voltammetry instrument certified by the EPA as an acceptable method to use in lead field analysis, with a lower limit of detection of 2 μg/L. Independent comparative analysis demonstrated excellent correlation of test results between the SA1100 and laboratory based instrumentation. Each test using the SA1100 Scanning Analyzer takes approximately three minutes and costs considerably less that a test conducted by AAS. The simplicity of the Palintest instrument made for easy integration into the testing program and the reduced cost per test allowed three times the number of sample analyses on drinking water fountains in the school facilities for the same cost. If any fountain exceeded the lead warning concentration of 10μg/L, samples would be taken to the certified laboratory for confirmation of elevated lead levels on the AAS. In the meantime, the fountain would be immediately removed from service, thereby removing the risk and allow for swift corrective actions and location of the source of the issue in a more effective manner. Palintest is a global provider of water and environmental analysis equipment. Its products are in use worldwide within applications such as potable water supply, healthcare, process industries, environmental monitoring, leisure facilities, and agriculture and are backed by over 70 years of research.